Bevacizumab (anti-VEGF) is a humanized anti-VEGF monoclonal antibody which binds to and neutralizes all human VEGF-A isoforms and bioactive proteolytic fragments, MW:149 KD. PDGF-AA induces Ezh2 expression and proliferation in juvenile islets but not in adult islets. Western immunoblots of indicated islet proteins from 3 week or 9 month-old WT islets 2 days after exposure to PDGF-AA alone, or PDGF-AA plus RTK inhibitors Sunitinib. Representative confocal image (10 x objective) of individual spheroids fixed, sectioned, and then stained for vimentin (green) and DNA (DAPI, blue). Vimentin protein expression from sections quantitated from multiple replicate spheroid treatments with U0126 and axitinib using ImageJ software. Motesanib (AMG-706) is an orally bioavailable receptor tyrosine kinase inhibitor with IC50 values of 2 nM, 3 nM, 6 nM, 8 nM, 84 nM, 59 nM for VEGFR1, VEGFR2, VEGFR3, Kit, PDGFR and Ret, respectively. Fruquintinib is a small molecule inhibitor with strong potency and high selectivity against VEGFR family. It inhibits VEGFR 1, 2, 3, with IC50 values of 33 nM, 35 nM and 0.5 nM, respectively and shows only weak inhibition of RET, FGFR-1 and c-kit kinases. Toceranib phosphate, the phosphate salt of toceranib, is a selective inhibitor of the tyrosine kinase activity of several members of the split kinase RTK family, including Flk-1/KDR, PDGFR, and Kit with Ki values of 6 nM and 5 nM for Flk-1/KDR and PDGFRβ, respectively. Lenvatinib Mesylate is a synthetic, orally available inhibitor of VEGFR2 tyrosine kinase with potential antineoplastic activity. Nintedanib is a small molecule tyrosine-kinase inhibitor with IC50 of 34 nM/13 nM/13 nM, 69 nM/37 nM/108 nM and 59 nM/65 nM for VEGFR1/2/3, FGFR1/2/3 and PDGFRα/β, respectively. Cediranib Maleate is the maleate salt of Cediranib, which is a potent inhibitor of VEGFR with IC50 of <1 nM and also inhibits Flt1/4 with IC50 of 5 nM/≤3 nM. Apatinib is a potent inhibitor of the VEGF signaling pathway with IC50 values of 1 nM and 13 nM for VEGFR-2 and Ret, respectively. Anlotinib (AL3818) is a highly potent and selective VEGFR2 inhibitor with IC50 less than 1 nM. It has broad-spectrum antitumor potential in clinical trials. (A) Representative in vivo bioluminescence of mice at and during time of treatment. Derived cell lines with either BCR-ABL1 WT or V299L was tail-vein injected into immunocompetent recipient mice. Initial imaging was performed at day 10 post-transplantation. Mice were subsequently treated once daily with vehicle, 10 mg/kg dasatinib, 50 mg/kg imatinib, 50 mg/kg vandetanib, or 50 mg/kg foretinib. (B) Fold change in total whole-mouse bioluminescence signal between post- and pre-treatment. Mice bearing BCR-ABL1 V299L ALLs showed significant tumor burden reduction upon treatment with foretinib or vandetanib. Statistical significance determined by Mann-Whitney test. *p < 0.05, **p < 0.01. PBLs from CLL5 were treated with vehicles (0.1% ethanol and 0.005% DMSO), 106 M dexamethasone, 50 nM BIBF 1120, or both for 24 h. Cells were also treated with 0.1% ethanol or 106 M dexamethasone in the presence of either nonphosphorylated (control) EGQYEEIP or phosphorylated EGQY*EEIP H2O soluble peptides (200 nM) for 24 h.
Pazopanib HCl (GW786034 HCl) is a novel multi-target inhibitor of VEGFR1, VEGFR2, VEGFR3, PDGFR, FGFR, c-Kit and c-Fms with IC50 of 10 nM, 30 nM, 47 nM, 84 nM, 74 nM, 140 nM and 146 nM in cell-free assays, respectively. IC50 of Pazopanib that block ANDV-induced EC permeability. Endothelial cells were ANDV infected, and 3 days postinfection the permeability of cells in response to VEGF addition was determined in the presence or absence of increasing amounts of kinase inhibitor. (B): VEGFR2-Src inhibitors block ANDV-induced permeability. Endothelial cells were plated on vitronectin-coated Transwell inserts and infected at an MOI of 0.5 in triplicate with ANDV. Three days postinfection, the permeability of ANDV- and mock-infected endothelial cell monolayers was determined at indicated times in the presence or absence of Pazopanib. Cediranib (AZD2171) is a highly potent VEGFR(KDR) inhibitor with IC50 of <1 nM, also inhibits Flt1/4 with IC50 of 5 nM/≤3 nM, similar activity against c-Kit and PDGFRβ, 36-, 110-fold and >1000-fold selective more for VEGFR than PDGFR-α, CSF-1R and Flt3 in HUVEC cells. Phase 3. Western blots of EZH2 expression in A549, HCC461, and HCC4006 cells upon treatment with different doses of VEGFR-2-inhibitor AZD2171 (0, 5 and 10 nM). AZD2171 decreased the expression of EZH2 in HCC4006 and HCC461 cells expressing VEGFR-2 in a dose-dependent manner but did not do so in A549 cells lacking expression of VEGFR-2. The inhibitor PD173074 (A) or PD184352 (B) was administered to one uterine horn of Hand2d/d mice on day 3 of pregnancy (n = 5). The other horn served as vehicle-treated control. Uterine horns were collected on the morning of day 4, and sections were subjected to IHC to detect p-FRS2, p-ERK1/2, and Ki-67. (C) IHC of pERa and Muc-1 in uterine sections of Hand2d/d mice treated with PD173074 or PD184352. Dovitinib (TKI258, CHIR258) is a multitargeted RTK inhibitor, mostly for class III (FLT3/c-Kit) with IC50 of 1 nM/2 nM, also potent to class IV (FGFR1/3) and class V (VEGFR1-4) RTKs with IC50 of 8-13 nM, less potent to InsR, EGFR, c-Met, EphA2, Tie2, IGF-1R and HER2 in cell-free assays. Phase 4. In vitro assays on CUX1-FGFR1-expressing Ba/F3 cells. a. IL-3 deprivation of Ba/F3 cells transduced with CUX1-FGFR1 resulted in transformation to growth factor independent growth. The mean growth ±SEM of three separate measurements over four consecutive days is presented. b. The dose-response curves of CUX1-FGFR1-transduced Ba/F3 cells, treated with TKI258 and PKC412 for 48 hours in the absence or presence of IL-3 (2 ng/ml) are presented. Points represent the average results of two experiments done in triplicate plotted with the curve-fitting GraphPad Prism 5 software; bars, SD. The calculated IC50 for each inhibitor is indicated. c. Western blot analyses of CUX1-FGFR1-transformed Ba/F3 cells after treatment with PKC412 and TKI258. Phosphorylation of CUX1-FGFR1 and its downstream effectors STAT5 and RPS6K decreased with increasing inhibitor concentrations. Expression of total CUX1-FGFR1, STAT5 and RPS6K remained unaffected. d. Effect of PKC412 and TKI258 on apoptosis of CUX1-FGFR1-expressing Ba/F3 cells after treatment for 48 hours. The percentage of apoptotic plus necrotic CUX1-FGFR1-transduced Ba/F3 cells is indicated. Linifanib (ABT-869) is a novel, potent ATP-competitive VEGFR/PDGFR inhibitor for KDR, CSF-1R, Flt-1/3 and PDGFRβ with IC50 of 4 nM, 3 nM, 3 nM/4 nM and 66 nM respectively, mostly effective in mutant kinase-dependent cancer cells (i.e. FLT3). Phase 3. Effect of the anti-vascular agents Linifanib (100 nM) in the VMO(vascularized micro-organ). VMOs were exposed to the drug at day 5 and cultured for an additional 96 h.
Tivozanib (AV-951) is a potent and selective VEGFR inhibitor for VEGFR1/2/3 with IC50 of 30 nM/6.5 nM/15 nM, and also inhibits PDGFR and c-Kit, low activity observed against FGFR-1, Flt3, c-Met, EGFR and IGF-1R. Phase 3. After serum-starvation for 24 h, the MCF7 cells were co-treated with 10 nM TPA and the indicated doses VEGFR inhibitor, Tivozanib, for 24 h. The levels of fibronectin, p-PKC-α, p-ERK, p-AKT, t-AKT and β-actin protein expression were analyzed by western blotting. The levels of fibronectin mRNA were analyzed by real-time PCR. The results are representative of three independent experiments. The values shown are the means ±SEM. * P < 0.05, ** P < 0.01 vs. control. # P < 0.05, ## P < 0.01 vs. TPA-treated cells. Con: control. LY: LY294002, U: UO126, Go: Go6983, Akt IV: Akt IV inhibitor. Motesanib Diphosphate (AMG-706) is a potent ATP-competitive inhibitor of VEGFR1/2/3 with IC50 of 2 nM/3 nM/6 nM, respectively; similar activity against Kit, ~10-fold more selective for VEGFR than PDGFR and Ret. Phase 3. Brivanib is an ATP-competitive inhibitor against VEGFR2 with IC50 of 25 nM, moderate potency against VEGFR-1 and FGFR-1, but >240-fold against PDGFR-β. Phase 3. Alofanib inhibits fibroblast growth factor 2 (FGF2)-induced proliferation of human and mouse endothelial cells. Dose-response effect of alofanib was evaluated in HUVEC endothelial cells in comparison with brivanib. Cells were treated with different concentrations of alofanib, brivanib for 6 h followed by stimulation with 25 ng/ml FGF2. Cell growth inhibition were assessed. RE-luc2P-HEK293 cells were pretreated with 1uM OSI-930 (green), 20uM TBB (blue), 10uM CKI-7 (purple), or 10uM H-89 (orange) for 16 h and infected with Y. enterocolitica WA or Y. pestis Ind195 at MOI 1 and 20, respectively, for 1 h. Following stimulation with 10 ng/ml TNF-α at 5 h post-infection, luciferase activity was measured 24 h post-infection. Results were determined from two independent experiments performed in triplicate. A"*" denotes that the % NF-κβ inhibition using the inhibitors was significantly different (p<0.05) compared to the no drug control (black). The relative NF-κB inhibition by Yersinia infection was determined as a percentage of luciferase activity in bacteria-infected cells relative to luciferase activity in bacteria-free control cells. Ki8751 is a potent and selective inhibitor of VEGFR2 with IC50 of 0.9 nM, >40-fold selective for VEGFR2 than c-Kit, PDGFRα and FGFR-2, little activity to EGFR, HGFR and InsR. Ki8751, a VEGFR2 inhibitor, significantly mitigated the proliferation-stimulating effect of dying U87 cells on HUVEC-Fluc (one-way ANOVA, LSD, n=3). Telatinib is a potent inhibitor of VEGFR2/3, c-Kit and PDGFRα with IC50 of 6 nM/4 nM, 1 nM and 15 nM, respectively. Phase 2. KRN 633 is an ATP-competitive inhibitor of VEGFR1/2/3 with IC50 of 170 nM/160 nM/125 nM, weakly inhibits PDGFR-α/β and c-Kit, does not block the phosphorylation of FGFR-1, EGFR or c-Met in cell. Inhibited migration of hNSCs toward HeLa cells with the treatment of KRN633, a VEGFR2 inhibitor. The cultured hNSCs were treated with KRN633 for 6 h. After that, the transwell migration assay was performed as described above. The number of migrated cells was counted and the results were presented as means ± SD. Magnification,× 200. *P < 0.05 vs. KRN633 non-treated GESTECs. (A) Migrated HB1.F3.CD cells. (B) Migrated HB1.F3.CD.IFN-β cells. Dovitinib Dilactic acid (TKI258 Dilactic acid) is the Dilactic acid of Dovitinib, which is a multitargeted RTK inhibitor, mostly for class III (FLT3/c-Kit) with IC50 of 1 nM/2 nM, also potent to class IV (FGFR1/3) and class V (VEGFR1-4) RTKs with IC50 of 8-13 nM, less potent to InsR, EGFR, c-Met, EphA2, Tie2, IGFR1 and HER2. Phase 4. SAR131675 is a VEGFR3 inhibitor with IC50/Ki of 23 nM/12 nM in cell-free assays, about 50- and 10-fold more selective for VEGFR3 than VEGFR1/2, little activity against Akt1, CDKs, PLK1, EGFR, IGF-1R, c-Met, Flt2 etc. Inhibition of VEGFR-3 reduces tube formation of lymphatic endothelial cells. The cells were incubated with or without VEGF-C (100 ng/mL) in the absence or presence of SAR131675 (10 nM). The graph indicates the tube score ratios after treatment with VEGF-C and SAR131675 for 8 h. SAR; SAR131675. (N = 3); *, p<0.05. Brivanib alaninate (BMS-582664) is the prodrug of BMS-540215, an ATP-competitive inhibitor against VEGFR2 with IC50 of 25 nM. Semaxanib (SU5416) is a potent and selective VEGFR(Flk-1/KDR) inhibitor with IC50 of 1.23 μM, 20-fold more selective for VEGFR than PDGFRβ, lack of activity against EGFR, InsR and FGFR. Phase 3. Injected tumor cells move to the tail via blood vessels. Tg (flil1:egfp) embryos at 20 hpf were treated with 2 μM SU5416 for 1 hr (+SU5416) to inhibit vasculogenesis24; the control fish were treated with 0.02% DMSO for 1 hr (-SU5416). After 1 hr, SU5416 or DMSO was washed out by changing fish media. At 48 hpf, tfRFP-B16 cells were injected into the pericardium cavity of fish. Representative images show that tumor cells moved to the tail in a drug-free larva, while no tumor cells moved to the tail in a drug-treated larva after new vessels were inhibited by SU5416. Insets are enlarged images from each corresponding tip of the tail indicated by white arrows. Dashed white lines mark extravasated tumor cells at 12 hpi. Vessels are green and tumor cells are red. –SU5416, 6 other larvae exhibit similar behaviors; +SU5416, 3 other larvae exhibit similar behaviors. Scale bars, 500 μm. Insets, 100 μm. ZM 306416 is a VEGFR (Flt and KDR) inhibitor for VEGFR1 with IC50 of 0.33 μM, but also found to inhibit EGFR with IC50 of <10 nM. Panels D-F show morphological changes of RBEC cells due to Sema3A treatment. RBECs were fixed after the indicated treatment and stained with phalloidin conjugated with rhodamine (red color) and counter stained with DAPI (blue color). F-actin stress fibres are very clear in untreated cells (D). Sema3A treatment caused disruption of F-actin inside the cells. Densely packed bundles of cortical actin filaments started to appear along cell membranes (arrows) over the course of treatment with Sema3A. Antibodies and inhibitors against receptors of Sema3A were pre-incubated with the cells for 15 min before the addition of Sema3A. Antibodies to VEGFR1 and NRP2 (panel E) and the inhibitor Zm 306416 (selective to VEGFR1, panel F) were effective in ameliorating the effect of Sema3A. Scale bar=20 μm. ZM 323881 is a potent and selective VEGFR2 inhibitor with IC50 of <2 nM, almost no activity on VEGFR1, PDGFRβ, FGFR1, EGFR and ErbB2. (A) Fluorescence microscopic analysis of Hoechst 33342 staining of NCIH460 and NCI-H460/MX20 cells. Cells were treated as described in ‘2. Materials and Methods’. Scale bar, 10 μm. (B) Effects of ZM323881 on intracellular accumulation of [3H]-mitoxantrone in NCI-H460 and NCI-H460/MX20 cells. (C) Efflux of [3H]-mitoxantrone in the absence and presence of inhibitors in NCI-H460 cells. (D) Efflux of [3H]-mitoxantrone in the absence and presence of inhibitors in NCI-H460/MX20 cells. A: Overall structure of LY2874455/FGFR4 complex. B: The diagram of LY2874455. C: Fo-Fc omit map of LY2874455 in the FGFR4/LY2874455 complex. The electron density is superimposed with the final model. D: The DFG motif conformation of FGFR4. Active ApoFGFR4 DFG-in conformation is shown in blue (PDB: 4QQT); FGFR4/Ponatinib DFG-out conformation is shown in yellow (PDB: 4UXQ); FGFR4/BLU9931 DFG-in conformation is shown in pink (PDB: 4XCU); FGFR4/LY2874455 DFG-in conformation is shown in grey (this work). LY2874455 is highlighted in brown. 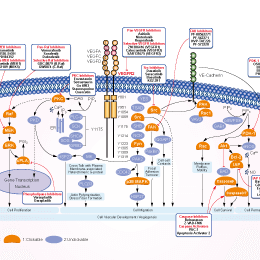 Four FGFR inhibitors, namely PD-173074 (PD-74), PD-166866 (PD-66), SU5402 (SU54) and NVP-BGJ398 (BG-98), inhibit A673, SKNMC, POE, RDES and SKES Ewing cell growth in vitro in a dose-dependent manner, whereas normal cells (IMR90 fibroblasts) remained unaffected. PD-74 proved to be most effective in four out of five Ewing sarcoma cell lines tested. Cells were grown in 10% FBS conditions and cell proliferation was measured after 72 h using a Resazurin assay. Dovitinib (TKI258) Lactate is the Lactate of Dovitinib, which is a multitargeted RTK inhibitor, mostly for class III (FLT3/c-Kit) with IC50 of 1 nM/2 nM, also potent to class IV (FGFR1/3) and class V (VEGFR1-4) RTKs with IC50 of 8-13 nM, less potent to InsR, EGFR, c-Met, EphA2, Tie2, IGFR1 and HER2. Phase 4. (c) Percent survival for the AGS cancer cell line is shown with FGFR2 inhibitors of varying specificity. (d) The KatoIII diffuse gastric cancer cell line was treated with FGFR2 inhibitors of varying specificity. The Y-axis depicts percent survival versus the X-axis with log concentrations. In all panels, error bars represent standard error of the mean. The difference in percent cell survival between KatoIII and AGS cells was statistically significant (P <0.05) at the three highest concentrations of all drugs, except Brivanib which was only significant at the highest concentration. BFH772 is a novel potent oral VEGFR2 inhibitor, targeting VEGFR2 kinase with IC50 of 3 nM. SKLB1002 is a potent and ATP-competitive VEGFR2 inhibitor with IC50 of 32 nM. SGI-7079, a novel selective Axl inhibitor with an IC50 of 58 nM in vitro, inhibits tumor growth in a dose dependent manner and is a potential therapeutic target for overcoming EGFR inhibitor resistance. C57BL/6 mice (3 per group) bearing 10-day-established ID8 tumors were treated with control vehicle, R428 or SGI-7079 for 5 days and tumor cells and tumor-infiltrating T cells were analyzed by FACS. (A) The representative FACS plots (left) and statistical results (right) of PD-1 expression on tumor-infiltrating CD4+ T cells and CD8+ T cells.